in Kenya are battling for the right to run their own league. Many of the media reports appear to be equating the two bodies and accusing them of wrangling. despite the fact that going to court contravenes FIFA statutes. sides are fighting over sponsorship money. This is very far from the truth. 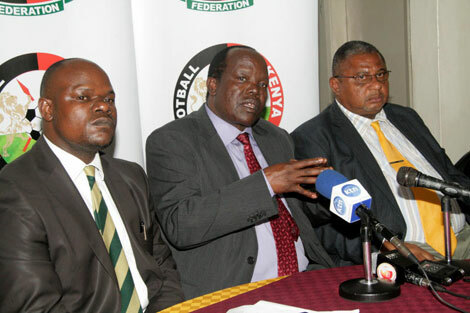 In reality it is FKF led by Sam Nyamweya and Robert Asembo who are eager to get their grubby hands on the money. About half of the FKF teams are corporate teams which pour more money into football than they get back. sponsorship revenue, something that the FKF league does not have. rarely the case, they deserve to keep it. supposedly warring parties, Nyamweya and FKF are the ones who clearly have ill motives. Most of the KPL chairmen are not fighting to gain financially. federation boss attended a Joint Executive Meeting held on January 19, 2015 to solve all outstanding issues and enter into a mutual MOU only to write a contradictory note to Fifa’s General Secretary Jerome Valcke”. faith by initially hiding the report from KPL and other parties. FKF has released dishonest statements such as indicating that Muhoroni Youth, Gor Mahia and AFC Leopards agreed to play in the FKF-PL. Sam Nyamweya is dishonest: He pre-set the wrong facts after the federation boss attended a Joint Executive Meeting held on January 19, 2015 to solve all outstanding issues and enter into a mutual MOU only to write a contradictory note to Fifa’s General Secretary Jerome Valcke”. The report suggested that all parties acknowledge KPL as the official body to run the Premier League in Kenya on behalf of FKF.FKF acted in poor faith by initially hiding the report from KPL and other parties. FKF claims they have a television sponsor ready and a title sponsor ready yet they have not identified them. So how is the public supposed to believe them? FKF under Nyamweya has done a poor job of running national teams be it the senior national team, the U23 team, women’s teams and so forth. Under Nyamweya Kenya has been humiliated by teams like Burundi, Lesotho and so forth. FKF has alienated sponsors like Safaricom, most notably by demanding a 20% cut of all sponsorship money. The 2013 CECAFA cup hosted by FKF was shambolic and poorly run to the point that teams like Zanzibar vowed never to play in Kenya again. Sam Nyamweya ensured that FKF officials who are interested in cleaning the game such as Sammy Shollei and Dan Shikanda were suspended. He suspended them for opening a court case in contravention of FIFA statutes yet he himself has flouted this same statute by taking KPL to court. FIFA even gave the FKF money to pay referees yet none of that money was given to referees. Nyamweya and Asembo now have their eyes on the sponsorship money and broadcasting money that is generated by the Kenya Premier League. success at anything. There have been virtually no positive developments in Kenya football since he took over. One of the few positive aspects of Kenya football over the last 10 years is the Kenya Premier League. And now Nyamweya and his ilk want to ruin that as well. The only thing that Nyamweya and the increasingly arrogant Asembo have on their side are technicalities which are basically rules that FIFA and CAF have put in place to keep corrupt officials in office. The media is doing football a disservice by equating KPL andf FKF. This moral relativism is what causes judges like Msagha Mbogholi to ban KPL. There is no law in Kenya that bans clubs from running their own league. In the absence of such a law, the high court should be making rules based on what is good for the country as a whole. And it is better for Kenya, the youth and fans if KPL is allowed to run the league. The point of this article is not to say that KPL is a well run organization where everything is above board. The point is that the Kenya Premier League will be better off if run by the top clubs and not by Sam Nyamweya and Robert Asembo. This entry was posted in Kenya Football News and Commentary, Kenya Sports news and commentary and tagged FKF, Kenya football wrangles, KPL, Robert Asembo, sam Nyamweya. Bookmark the permalink. The sooner the issue is sorted the better for everyone so it doesn’t really matter who is right or wrong. As the wrangle between fkf and kpl continues in the court corridors we the football fun and the clubs suffer while the only beneficiaries are the continually fattening lawyers who are happy with the status quo. So please I beg can the officials reach a consensus to slow the league to continue? I agree with your assessment but you are missing a key point here. Football is under the jurisdiction of FKF, a separate running body as EPL, KPL or PSL and even Algeria is only permissible by the federation. So FKF are within their right to take back running of the league. The problem though is that as you said they are totally inept and indeed have ulterior motives as relates with this move. The solution is the govt stepping in and disbanding them even with the risk of a ban. After all it would be funny for FIFA to ban us when FKF contravined their law on courts. We are tired of the Nyamweya”s and Asembo’s in the running of our football. No wonder we continue being ranked poorly in the FIFA RANKINGS yet they feel nothing about it.